It’s twenty years ago this week since Mel Gibson’s Braveheart was released. Which makes it twenty one years (yes, I am that old) since I interviewed him about it at the Cannes Film Festival, and then went on the set of the movie. Filmed in Ireland because of the tax breaks, the castle was standing in for an English fortress, assailed by the Scottish army. ‘Bring me a bucket of flaming arrows!’, yelled someone, memorably. It was still raining and that’s how I met Gibson – he was standing under a huge umbrella and offered to share it, generously. What struck me was that he made polite conversation for a few minutes before asking: ‘Er – who are you?’ A lot has happened since to give one qualms about Mel Gibson, but at the time it stuck me as gentlemanly. Especially since he was busy directing as well as starring in the movie. Besides the tax breaks, the film had use of the Irish reserve army. 1500 boy soldiers pretending to be boy soldiers: unused to the ‘hurry up and wait’ ethos of a film set, they’d been hanging around for weeks. But did they care? Not really. ‘When the film comes out and I’m back home, it won’t be Mel Gibson that’s the hero’, one of them said. ‘It’ll be me.’ That night, at least there was something for the watchers to see. A Scot was meant to have been set alight by one of those flaming arrows. I’m not sure the moment even made it to the finished movie. But as the stunt team and the cameras moved to film it, things had to be done precisely. As he lay on the ground, and they put the lit match to the human torch, the counting began, loudly. It was two other stunt men held the fire extinguishers – not a job you’d trust to a stray production assistant, is it, really? All well: and a round of applause broke out as the man got up. It was just after midnight when – moving in unison, clustered around their reprieved colleague – the stunt men marched away. The situation might have been a fake, but what was real had been the jeopardy. The next thing I remember is getting back to my hotel room, frankly. So what about the earlier interview, in Cannes? – out by the swimming pool of the Eden Roc. That stands out less clearly. 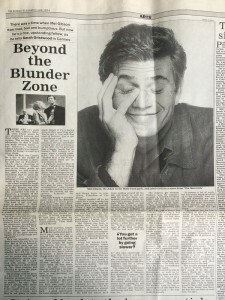 I wrote then that there were two sorts of Mel Gibson interview. ‘Those where he says absolutely nothing, and those where he says nothing serious.’ (Jeez, of how many celebrities was that true?) I wrote that at 36 ‘his famously boyish looks have not yet begun to ossify’. I wrote of the frantic energy which masked – or didn’t – certain difficulties . . . Sleb stuff, basically. ‘It’s as if you have your pants down around your ankles and your hands tied behind your back’, was what he said about being a celebrity. Did I sense anything more profoundly worrying? Mel Gibson has since expressed some views I find profoundly antipathetic. I think I felt the chill shadow of it, actually, But only the faint shadow made it through to the article – same with the problems about the history. Since Braveheart, Mel Gibson gas made several other films purporting to show historical events, and he has done it worryingly. The misinformation does not cease to matter – what, Scottish independence isn’t still a story? I swear, an entire generation of children grew up thinking that Scotland became part of the United Kingdom because England’s King Edward I did the dirty, not because Scotland’s King James VI rode south to become England’s James I with unflattering alacrity. Braveheart was widely attacked for historical inaccuracies – from the kilts to the killings, basically. But that didn’t stop it winning a Best Picture Oscar, and slew of others. And once again, this is not just an old story . . . This very month, there have been stories of a sequel, Lion Rampant, taking the story onwards with Robert the Bruce. True? We’ll see. We’ll see, too, whether history fares any better, this time around – because something should have matured in twenty one years. I’m just not sure if it’s Mel Gibson. Or, of course, me.